Quartz-cut design brings a new edge to TV with a hint of translucent color that emphasizes the hidden gem within. Each scene in everything you watch—HD movies, 3D, sports, even YouTube clips—is presented with unprecedented detail and clarity from Sony’s exclusive X-Reality PRO picture engine. And lifelike motion comes via Motionflow XR 480 technology for that at-the-game feeling. This is picture quality so lifelike it’s like looking through a window. Each scene in everything you watch—HD movies, sports, even YouTube clips and home movies—is presented with unprecedented detail, and astonishing color as Sony’s latest-generation X-Reality PRO picture engine cleans and refines images – restoring them to their original beauty with rich colors and high contrast – for our most lifelike picture ever. Golf balls roll clearly, with less blurring, as the camera follows them across the green. Footballs retain their detail and move smoothly as the camera pans quickly during a kickoff. 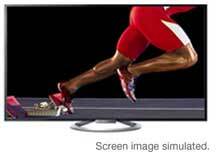 Even quick motion seen in action movies appears amazingly realistic as Motionflow XR 480 takes motion clarity beyond refresh rates, which are only measured in Hz, to double the motion effect for lifelike clarity. Whether you’re watching movies, live concerts, drama or sports – enjoy rich, dynamic sound from your TV speakers that feels like it’s filling the room. Unique to Sony, S-Force Front Surround technology processes audio signals to create an immersive, finely detailed soundstage that pulls you right into the heart of the action. 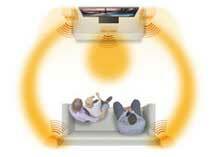 An enlarged ‘sweet spot’ lets you enjoy optimum audio reproduction, even if you’re not sitting dead-center right in front of the TV screen. It’s all about perfecting a natural look. Dynamic Edge LED backlighting with frame dimming delivers pitch-black night scenes and illuminates bright scenes. Rather than illuminating the entire screen, contrast is boosted in just the right areas for a more realistic picture. Movies, music and apps from your smartphone can now be viewed big on your TV. With three ways to connect Android phones and tablets to the W802A, Sony is helping you add value to the entertainment you already own2,5,6. Movies, music and apps from your smartphone can now be viewed big on your TV. With three ways to connect Android phones and tablets to the W802A, Sony is helping you add value to the entertainment you already own. 1.Using a Mobile High Definition Link cable, you can connect your smartphone to the TV to literally “mirror” what’s seen on the smartphone screen. Video, photos and apps are re-sized and scaled to fit the larger TV screen. You can then use the TV remote to navigate the phone, while it’s charging from the TV5. 3. Using One-touch mirroring with NFC technology, briefly place your compatible Xperia smartphone to the one-touch remote (sold separately). You’ll instantly be able to view exactly what is on your smartphone’s screen on the TV6. Using the same passive 3D technology used in movie theaters, feel the explosive excitement of theater-like 3D. Even the sound profile is enhanced for 3D viewing to provide a more immersive experience3. Slip on the latest generation of light, comfortable 3D glasses to enjoy your favorite 3D movies. Four pairs included. Get more from watching television with TV SideView. Control the TV or browse the channel guide with your smartphone or tablet (Android or iOS), all without having to minimize what you’re watching on the TV. Learn more about the show you’re watching right now, like cast and episode details. Search what’s available to watch on TV, internet videos and apps like Amazon Instant Video and Netflix. Once you find what you want to watch, you can select to view it on the TV. Make TV viewing more social by Tweeting about the show from your mobile device4. Say goodbye to split screen. Now you and a friend can both experience your own big-screen view of the action as you play nail-biting games on your PlayStation3 system. SimulView gaming presents two separate pictures: each player watches independently through light easy to wear optional Simulview glasses that don’t need batteries7. There’s already a growing choice of SimulView game titles available. It’s like they’re in the room with you. Skype video calls bring your family and friends closer than ever as they appear as large as life on your big screen—for free1. Just connect the easy-to-use Skype camera (sold separately) for a face-to-face look at the caller on the beauty of your Sony HDTV. 1. Broadband speed of at least 2.5 Mbps recommended (10 Mbps for HD). Content subject to change and may require fees. Wireless connectivity requires 802.11 home network (802.11n recommended). Skype requires CMU-BR100 or CMU-BR200 camera sold sep. Subject to Skype’s terms and conditions. 7. PS3 system and SimulView glasses sold separately. 8. 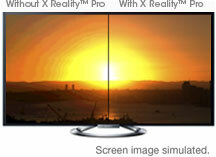 Actual panel resolution of XBR-X900A 4K Ultra HD TV is 3,840 x 2,160 pixels (in 16:9 aspect ratio). 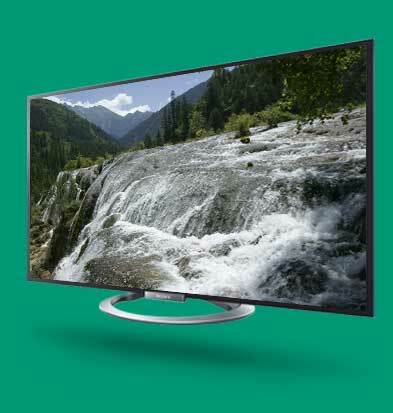 HDTVs have a panel resolution of 1,920 x 1080 pixels.